The second in our series of NHL coach profiles takes a look at Billy Reay, the man behind the bench of the Chicago Black Hawks. The 47-year-old Winnipeg native took a rather circuitous route before landing the enviable job of coaching two of hockey’s greatest superstars today, in Bobby Hull and Stan Mikita. Growing up in the St. Boniface area of Winnipeg, Reay was a shifty centre, a bit on the smallish side but with a great sense of the game. After a couple of seasons with the St. Boniface Seals of the Manitoba Junior Hockey League, he graduated to the Alberta Senior Hockey League with the Calgary Stampeders for a year. He was signed as a free agent by the Detroit Red Wings in October of 1939 and was assigned to the Omaha Knights of the American Hockey Association at age 21. Even at a young age, Reay gained a reputation as a great tactician and motivator. Subsequently, he was named the playing coach of the Quebec Aces of the Quebec senior league in the 1942-43 season at only 24 years old. He spent two seasons as a playing coach in Quebec before returning exclusively to the playing ranks in 1944-45. During this period, he had a couple of brief trials with the Red Wings. Just before the start of the 1945-46 season, the Montreal Canadiens expressed interest in Reay and sent Ray Getliffe and Rolly Rossignol to Detroit for him. At that point, Reay’s playing career took off. Billy Reay during his heyday with Canadiens. 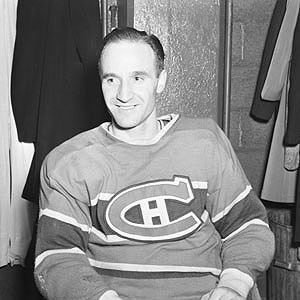 Reay spent the next eight seasons with Montreal, establishing himself as a strong, two-way centre, usually on the second line behind the great Elmer Lach. He had his best scoring season in 1948-49 when he scored 22 goals and added 23 assists for 45 points, a fine total in the 1940s. He won two Stanley Cups with Canadiens, in 1948 and 1953. After ending his NHL career in 1953 with Montreal, Reay played a couple of seasons with Victoria of the Western Hockey League before hanging up his skates for good. He was a playing coach with the Cougars for those two seasons before moving full-time into the coaching ranks with Seattle of the WHL for 1955-56. Reay made his NHL coaching debut with the Toronto Maple Leafs when he was hired to take over a weak and rebuilding team. In his only full season with Toronto, the Leafs finished dead last with a 21-28-11 record. Billy Reay with Leaf goalie Johnny Bower. In the 1958-59 season Punch Imlach arrived on the scene in Toronto as the general manager and it was clear that he and Reay did not see eye to eye. Imlach finally dismissed Reay 20 games into the that season and took over behind the bench himself. Reay sat out the 1959-60 season, but wasn’t out of work long, as the Chicago Black Hawks came calling and offered him the bench job with the Sault Ste Marie Thunderbirds of the Eastern Professional Hockey League for 1960-61. Reay did a fine job in the Sault, guiding the Thunderbirds to a second-place finish, before losing in the league finals. That performance earned him a promotion to the Hawks’ top farm club in Buffalo of the American Hockey League. Reay spent two fine seasons with the Bisons, taking the team to a Calder Cup victory in 1963. Right about that time, Chicago coach Rudy Pilous had fallen out of favour with Black Hawks management and he was let go. 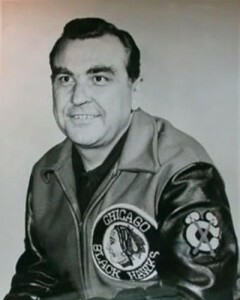 Reay was named coach of the Black Hawks on June 10, 1963. In his first two seasons with the Hawks, Reay’s club has made the playoffs each time. He has compiled a 70-50-20 record with a team that certainly seems on the rise. Reay is known as a player’s coach – gets along well with all his men, well-liked but also commanding respect. Players enjoy playing for Reay and want to do well for him. Reay also respects his players, and when an athlete needs a dressing down, it’s never a public affair, or a “chewing out” in front of the team. It usually happens in the privacy of the coach’s office. Hawks players love playing for Billy Reay. Reay is also known as an accessible coach with an open mind. A great example of this is the play of Doug Mohns on the Hawks’ famed “Scooter Line.” Mohns was acquired as a defenseman from the Boston Bruins in a deal that sent Ab McDonald, the line’s regular left-winger, to Boston. Mohns, despite being a full-time blue liner, had a great shot and was known as an excellent skater. 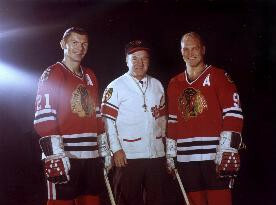 The two remaining members of the line, Stan Mikita and Kenny Wharram, approached Reay and suggested that Mohns be moved onto their line in the left-wing slot. Reay took their suggestion and Mohns slid into the spot seamlessly, making the line one of the most feared in the NHL. After two seasons, Billy Reay seems to be firmly ensconced as Chicago’s mentor. It would seem to be only a matter of time before he gets the opportunity to sip champagne from Lord Stanley’s mug. 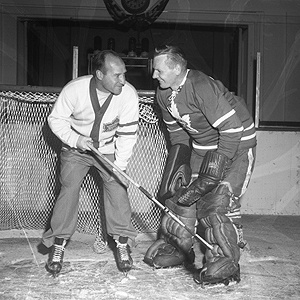 Red Kelly says he has decided to give up politics and play for the Toronto Maple Leafs for at least one more season. Rod Seiling has signed his 1965-66 contract with the New York Rangers. Leafs’ Ron Ellis says that the knee surgery he underwent this summer is healing well and he expects to be ready for the Leafs’ home opener. Dickie Moore has informed the Toronto Maple Leafs that he is retiring from hockey. The NHL season will open on October 23, the latest start in 20 years.